To create a bootable USB drive manually, we will use the Command Prompt as a Windows default program. Here are step by step to create a bootable USB drive as the Windows installation media. To create a bootable USB drive as a Windows installation media, we require at least 4 GB for minimum capacity. Larger capacity is better. At this moment, I use the USB flash drive with 2 GB of capacity as just an example. Insert your USB flash drive to your running computer. As the first step, we need to run Command Prompt as administrator. To do this, we need to find cmd by typing ‘cmd’ in the search box on Windows Start Menu. After search result for ‘cmd’ appears, right click on it and select “Run as administrator”. 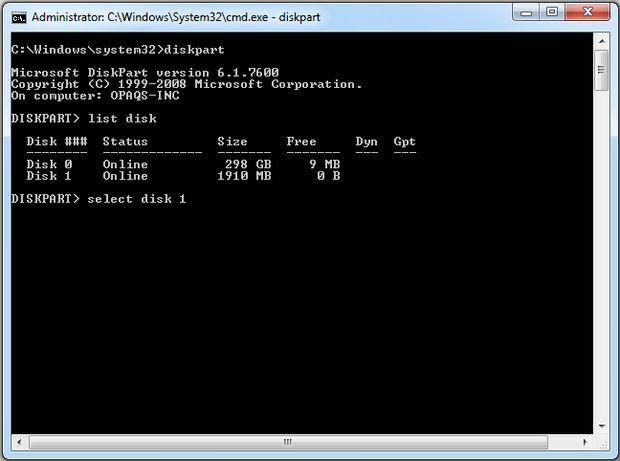 Type ‘diskpart’ on Command Prompt (without quotes) and hit Enter. Wait for a while until the DISKPART program run. Type ‘list disk’ to view active disks on your computer and hit Enter. There would be seen that the active disks shown as Disk 0 for hard drive and Disk 1 for your USB flashdrive with its total capacity. I’m not sure where you are getting your info, but good topic. I needs to spend some time learning more or unidnstaredng more. Thanks for magnificent information I was looking for this Pictures really do tell a lot of words for my mission.